An Indian motorbiking ikon, but much maligned for its perennial mechanical shortcomings, the Royal Enfield Bullet has been accorded a facelift of sorts with the 'Electra', a metallic-hued monster that has shed some of its traits of torment. Sirish Chandran gets a leg over the original m(e)an machine and comes away delighted...... almost! So who in God's name buys a Bullet? Skeptics and so-called 'critics/experts' have retorts like 'men blessed with half a brain' or 'masochists' or worse 'womanisers' at the tip of their tongues to define Bullet aficionados. But are these informed opinions or just unwanted slandering of an icon of national progress? Well, yes and yes in equal measure. All the jokes about the venerable Bullet are partially rooted in reality. Who else but a masochist (or a person severely handicapped in the brains department) would buy a bike that leaks oil on the first day, snaps cables on the second, drops off the exhaust pipe on the third and faithfully takes you to the hospital on the fourth day to get your backbone rearranged? We Indians buy bikes keeping in mind precisely two factors; a) Fuel Efficiency and b) value for money (read as initial purchase price). There is also the small urban populace for whom style is as important. But even here mileage does play a big role judging by customer preference for the Fiero over the CBZ. Entangled in this single-minded obsession with mileage and VFM is the Bullet buyer. In my opinion unless you can afford an imported bike, there is (was!) only the Yamaha RD350 and today only the Royal Enfield Bullet that can satiate the appetite of the true-blue motorcycling enthusiast. (Objections/contradictions etc to the usual office address). Of the two, mint RD350s aren't exactly yours for the taking so that leaves us enthusiasts with just the Bullet. Which is where we begin to delineate the Bullet buyer, Bulleteer to the informed. Bulleteers are all male. Bulleteers don't cry. They make others cry. Bulleteers wear boots, own a rarely used leather jacket preserved in the closet, visit the gym regularly (may or may not have muscles), have girlfriend/s, and one of his many best friends is the nearest Bullet mechanic/spare part dealer. Bulleteers don't buy their bikes for mileage, ride comfort, low noise levels, ease of riding, slick gear shifts or any of the other factors lesser beings (read pansies) look for in their bikes. A Bulleteer has a second bike in the garage and invariably it is a high-mileage Kinetic Honda (after all a Bulleteer has to go to work/college daily). No gears and a self-starter squashes all masochist allegations. Bulleteers are mechanically inclined. Addendum: if a Bulleteer isn't mechanically inclined, his pants are always stained black (bike leaking oil from everywhere). Last but most importantly, a Bulleteer's heart works more than his head. Now before you scream 'rubbish' and rush to flush this mag down the toilet, I shall stop this nonsense and get down to the road test of the bike at hand. Let's get one thing straight though. Bullet 'Electra' doesn't translate into a Bullet with an electric starter. For that we may have to wait for another absurdly monikered bike like maybe the 'Thunder'! Classic Bullet styling. Umm, I like.This is what a Bullet should look like. Period. Fiddling around with that classic Brit street bike looks in the form of the various Lightning models resulted in what can at best be described as a botched effort. So now let us put down this mag and fold our hands in a silent prayer thanking Royal Enfield for basing the Electra on the standard Bullet and not on some in-house marriage of the Bullet and a Harley-Davidson. The Bullet Electra comes in three eye-delighting shades of silver, blue and maroon (electrifying colours, as Royal Enfield prefers to call them). Distinguishing her from the Machismo models is the fully painted tank unlike the part-chrome part-painted tank of the former. Also the ungainly black rubber kneepads on the tank have been ditched to facilitate clean uncluttered lines. This also makes the Royal Enfield logo on the tank stand proud and the smart sticker job beneath it lends real character. Having harped about the treatment of the tank, I am now at a loss for words. What more can I say that all of you don't already know? I could mention the chromed mudguards, but you already know that. I could mention the huge 19-inch wheels that give the Bullet massive street presence, but you already know that. I could also mention the famous Bullet casquette that incorporates the park and headlamps in addition to the speedo and ammeter but you have already seen and eith er hated or loved it. And lest I forget, the tail lamp has been replaced to mimic the original 1955 Bullet's. The rationale? Answers to the usual address please, the best one wins an official OVERDRIVE cap. The one thing that deserves mention is the powerplant. The engine of any Royal Enfield bike is as much a part of the visual excitement as say the paint job or the amount of chrome. And with the ugly and disproportionate (though technologically superior) AVL powerplant this visual excitement flew out of the window. Now Royal Enfield has finally realised the importance of the visual appeal of the engine and thus the Electra derives motion from the ancient 350cc lump that originated way back in the 1930s. Back then an engineer was also an artist and everything was designed with a sense of proportion and aesthetic considerations weren't simply an afterthought. This 350cc lump may not be a marvel of packaging or boast compact proportions but what it has is real character. The engine has now been polished up; the dummy timing gear casing has been chromed in addition to the gearbox while the clutch cover now sports a machined look. This is in addition to the chromed air-filter and battery box covers and that lovely exhaust pipe. Switchgear is the same unit as on other Bullets of which only the easier to operate handle lock deserves mention. The seat unit is frankly the best you will come across on any bike. Firm, right support in all the right places and most importantly your crotch isn't banged to bits against the tank under heavy braking or when the bike takes off over a speedbreaker. If you are a keen observer of details, you will also notice that the bike has been propped up on a side stand. 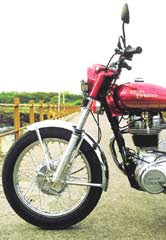 Yes, Royal Enfield has managed to design a side stand that actually works. And lest I forget, the horn finally is louder than the bike itself. A good thing or bad, you decide. Build quality of the Electra is again a letdown. We have always said that the Bullet vibrates so much that all the nuts and bolts loosen up and eventually fall off. But that's not an excuse Royal Enfield can subscribe to. The fact that they haven't been able to get quality levels right in spite of making just one solitary model for almost fifty years puts the company in very poor light. The rear footrests were loose when the bike was delivered to us, the bolt attaching the exhaust pipe to the rear sub frame fell off and the headlamp and tail lamp fused twice in the span of a week. A shame really as the headlamp on this bike is the best that I have come across, better than even the Eliminator's. But then other problems like petrol leaking from the fuel flap, oil leaks from the engine, carburettor gaskets working loose, air filter filling up with water etc haven't manifested themselves. Reminds me of Murphy's Law: If you perceive that there are four possible ways in which a procedure can go wrong, and circumvent these, then a fifth way, unprepared for, will promptly develop. In case of the Bullet you can rest assured sixth, seventh and eighth ways will also develop! 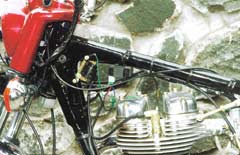 Electronic ignition on a 1930s engine in 2001 has got to be big news. Don't think so? 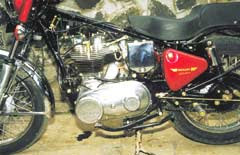 The ancient 350cc lump that originated way back in the 1930s powers the Electra. The big news is that the troublesome g ear driven contact breaker system (CB points) has made way for CDI ignition. The CB points used to be a major irritant demanding constant attention, adjustment and God save you if water got into it. Now with the CDI unit, all these problems have been taken care of, a very good thing at that. But then you win some and lose some. In this case the barely audible tickover of the engine with accurately adjusted CB points has given way to a fastish and noisy idle, not as noisy as the AVL engine but not what we are used to. The engine develops 18bhp at 5625rpm and a max twist of 26.9Nm at 2875rpm (yes exactly 5625 and 2875rpm). The four-stroke unit has bore and stroke dimensions of 70x90mm, instrumental in that glorious exhaust thump. Breathing is via a Micarb VM24 carburettor. Once you get used to it, starting the bike is a piece of cake. Decompress, half-kick, release and then give it a good kick. Master the art and all those horror stories of hip-dislocating back kicks will be rubbished. Transmission of power is handled by the age-old gearbox located on the wrong side (left side). Bulleteers will argue that other bikes have their gear levers on the wrong side but that argument shall be left for another time and place. The gearbox can accurately be described as a box full of neutrals. There is a neutral between every gear and the neutral finder makes finding true neutral a piece of cake. Shifting gears is a pain, a royal pain, an art that you really can't master. The Lord has decreed that a Bulleteer will find false neutral at least once every 10km. Not surprising then that all Bulleteers favour army issue boots to sneakers. Same age old design.The chassis is the same single downtube using the engine as a stressed member. Telescopic forks at the front and 5-stage adjustable shocks at the rear endow the bike with a barely acceptable ride quality. Throw the bike into potholes and ditches and you will end up in the hospital, make no mistake about it.The longish (1370mm) wheelbase endows the Electra with superb straig ht line stability, hardly affected by crosswinds. Handling of the bike is good though feedback is limited. She can be coaxed into scraping her footpegs but at these extreme angles of lean it is all a matter of faith, that the bike will hold her line and not spit you off. Won't electrify your senses or burn the road. We always knew that the Bullet had adequate Performance. We also knew that if you want to go on a long (and I mean long) biking trip, you have two options - the Bullet or any other bike plus a truck to haul it back after it breaks down. Bullets were never meant for wining traffic light grand prix races. No sir, not until the Lightning 350 arrived and grabbed the crown of the fastest bike in production today. So getting back to the standard Bullet after being spoilt by the Lightning was a bit of a letdown. In our measured acceleration runs, the Electra took 8.1 seconds to hit 60kmph and 13.9 seconds to hit 80kmph from a standing start. Compare this to the Machismo 350 that takes 6.3 seconds and the taller geared Lightning 350 that takes 6.2 seconds and you will understand why I am a trifle disappointed. The Electra maxes out at 100.65kmph (as opposed to the 110 plus speeds the other two are capable of). The quarter mile is achieved in 22.2 seconds, the Datron test gear registering 92.9kmph at this speed. Coming to the roll-on figures, the Electra took 9.5 seconds in third and 15.0 seconds in fourth to cover the benchmark 30 to 70km ph test. Put these figures in perspective and you will realise that the Electra is not slow, not by a long shot. Launch her right and you can have almost any bike for breakfast. Where the Bullet excels (her forte if you wish) is in touring. Out on the open road the Bullet will thump all day at a steady 90kmph without skipping a beat. We feel that it is high time that the gear ratios are revised and a fifth gear is also incorporated. Royal Enfield did it for the Lightning 350 that made her go like stink. A shorter fifth gear and taller first and second on the Electra will achieve the twin objectives of fiery acceleration and higher cruising speeds. Hope Royal Enfield doesn't forget this for their next model. 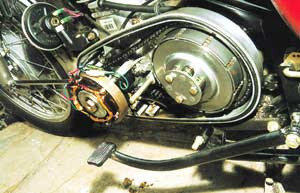 Braking is taken care of by 7-inch twin leading shoe drum brakes at the front and a 6-inch single lead drum at the rear. 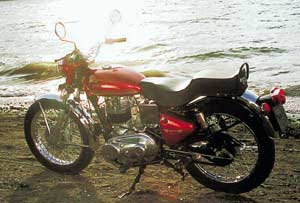 This is the same setup on the other Royal Enfield bike and the same criticisms still apply. The brakes, adequate at moderate speeds, become woefully inadequate as speeds rise. Braking from 60kmph to rest was achieved in 3.2 seconds, the bike covering a distance of 26.8 metres. This is not much worse than other 100cc bikes equipped with drums but the Bullet carries so much inertia that if you slam into anything at any speed, it will bring down the building. The brakes lack any feel whatsoever and a mammoth grab on the brake lever is called for to achieve any retardation whatsoever. So there! The secret why Bulleteers have muscular forearms has been revealed. Skinny Bulleteers have retro-fitted disc brakes on their bikes (and no scars or broken bones either). A little heavy on the wallet. The Electra returned 38kmpl on the highway run while on the city run, the mileage dropped to 32kmpl. 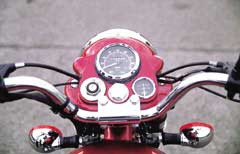 Not very acceptable to whoever pays your fuel bills but then what the heck, which other bike has the image of a Bullet? On a positive note, as the kilometres got logged on, the Electra started drinking less fuel. Stay tuned in for our long term updates on the Electra to see how her drinking habits progress over time. No other bike can have as huge or lasting an impact on your life as the Bullet. The Bullet can transform your outlook towards life, no less! One stands taller, shoulders feel broader, chest swells up and arms feel infinitely stronger. You feel invincible, like nothing or no one can lay a finger on you. (This invariably causes most problems but while the feeling lasts, it's great). While riding her, your hectic cutthroat schedule somehow seems to lighten up. As you use her, you develop a telepathic bond with the bike, she becomes a part of your system like no other bike can ever hope to. The riding pleasure that the Bullet offers is unmatched bar none. Sure when you get to a stretch of bad tarmac, your backbones are in for a little rearrangement but out on the open road, a couple of 100km from your destination, the throb of the 350cc lump between your legs, the fantastic exhaust note making merry music at a steady 90kmph... that's what touring is all about. That's what the Bullet is all about. And also for seeing and being seen on, I don't think there is a more manly bike available, not by long shot. 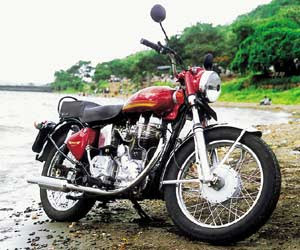 At Rs 63,139 on- road in Pune, the Electra is far from cheap. Value for money is not what the Bullet is about, not in term of initial purchase price nor in terms of running costs. At this price, the Bullet is an exclusive bike and has little or no competition. Bullets are bought by Bulleteers, you either love the bike or hate it. A Bulleteer is not going to buy a CBZ or Fiero and by extension, the CBZ/Fiero buyer is not going to step into a Bullet dealership. A Bulleteer may look over the Eliminator but personally I feel that the Eliminator buyer is in a different league. For this dedicated buyer, the Electra spells good news. 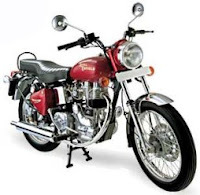 With the Electra Royal Enfield has managed to create a better Bullet. The old CB points that were a major headache have been sorted out. Now what remains to be sorted out is the ride (18-inch rims and better shocks), brakes (disc brakes), Performance (revised gear ratio) and the quality levels. And I hear that the cogs are already turning at Royal Enfield and precisely such a machine is on its way. Umm, I can't wait... Can you? thanks 4 posting dis gr8 review!!! I AM 45 YEARS OLD AND MY FATHER USE TO HAVE ROYAL ENFIELD I GREW UP WITH KING OF THE BIKE.AND NOW I AM HAVING ROYAL ENFIELD 4S THIS IS MY THIRD BIKE FROM ENFIELD IN INDIA THIS IS THE ONLY HEAD TURNING BIKE REST ALL LADIES BIKE,ROYAL ENFIELD IS KING IT’S A SINGH BIKE. It is marvelous to ride for long drive. well i like to modifi my bullet standerd 350 cc 1993 model .is it will become legal can i get the renuval any one please help me. I have a STD of which I changed the swing arm. Now its a flat swing arm that holds an 18″ 130mm rear MRF tire. When I’ve been cornering it I don’t feel all that comfortable. My friends been telling me the flat swing arm is not well balanced than the normal round ones. I have the new rear gas shocks and it doesn’t wobble. Also, does the combo of the front and the rear matter for smooth cornering? I think I have a 19″ 110mm on the front or whatever comes stock. Professional advice suggestions, very much appreciated. 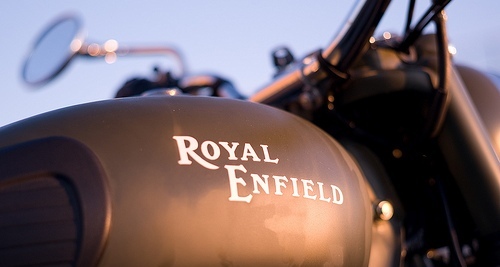 We love our 2010 royal enfield bullet 500! We live in Canada and it sure turns heads. A great conversation piece and a great ride!